Chemical products are required for all soft soldering and brazing procedures. They are integrated into the filler metal in products such as solder pastes and creams, preforms and cored wires. Otherwise, an external liquid, gel or powder flux must be used. The choice of flux depends on the characteristics of the parts being assembled, the filler metal and the heating method. They are used in all applications requiring use of an external flux such as building, heat exchangers and all mechanical or electrical assemblies. They complete the METACONCEPT Group’s range of ingots, bars, flat bars, sticks, blowpipes, solid wires and laminates. Our fluxes have been specially designed for all soldering procedures. They are highly effective in pickling the surfaces to be brazed and thus ensure high solidity of the joint. They have been developed to meet current environmental regulations. Flux storage: At room temperature, in its original sealed packaging. We can offer different types of packaging in accordance with the type of flux and the intended use. Our technical department will be happy to assist you in choosing the most suitable product and its packaging. ALPHA A83 Liquid rosin-based foam flux. Very good wettability and excellent capillarity. Meets the various requirements of static bath tinning processes. The ALPHA A83 flux andard NF-C-90550. Suitable for copper, nickel, brass and silver. ALPHA 425 The high temperature around flux baths inevitably leads to the evaporation of the alcohol contained within the fluxes. To maintain the initial dilution, it is advisable to add diluents regularly. You can use a hydrometer to correctly measure the product. Together with the ALPHA A83 flux. ALPHA SLS 65 No-clean organic flux, specially designed for wave and screen printing mask applications. No cleaning is required after brazing. Suitable for copper, nickel, brass and silver. WBF320S Mixed organic flux(water-alcohol) no VOCs, low solids, no-clean Suitable for copper, nickel and brass. RADSOL T208C Water-based flux, non-corrosive residues. This flux was first developed for dip brazing, but it can also be applied with a brush provided that its flammability is taken into account. It is suitable for treating copper, brass, bronze, tinned or brazed steels, nickel and most of its alloys, and gold and silver. 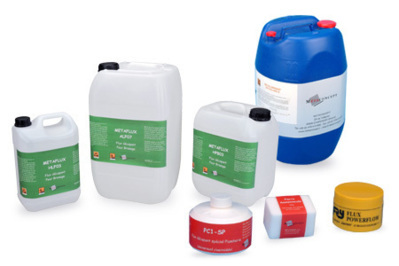 RADSOL 701 Water-based flux, non-corrosive residues, residues can be cleaned away with water. Developed for manual brazing and dip brazing. Excellent wettability, good penetration of the joints. It can be diluted with water depending on its final use. It is suitable for treating copper, brass, bronze, tinned or brazed steels, nickel and most of its alloys, and gold and silver. RADSOL 2101 Water-based flux, non-corrosive residues, cleaning with water after brazing. This flux was initially developed for dip brazing radiators and heat exchangers (baking radiators and brazing their collectors). It may be diluted with water depending on its final use. It is suitable for treating copper, brass, bronze, tinned or brazed steels, nickel and most of its alloys. META 2005 Aqueous zinc chloride-based flux, corrosive residues. The parts must be cleaned after brazing. Developed for manual brazing or dip brazing. Especially suited to copper and its alloys. META 2010 Organic non-corrosive flux, high deoxidising power. The parts stay as they are after brazing. Furnace, dip or flame brazing. Suitable for copper, brass and zinc. Decarboniser DECACLINE-S Organo-mineral acid blend, for the preparation of the metal’s surface. Soak the part in the DECACLINE-S bath for several minutes (10 minutes if the product is pure, 20 minutes if the product is 50% diluted with water). Suitable for tin-lead alloys, copper and its alloys. ALUFLUX Organic reactive flux, slightly pasty, non-corrosive residues. This flux removes the oxide film and allows the solder to tin-plate the metal base before the oxide film forms. The ideal heating temperature for obtaining a good soldered joint is 300°. Residues must be removed with hot water. Indispensable with OTALINE solder Suitable for soldering aluminium and its alloys. FRYSOL 60 Zinc chloride-based flux, corrosive residues, clean with hot water + citric acid if necessary, then rinse with fresh water. Apply with a brush, sprayer or via dipping. To remove the oxide film and to improve the adhesion of the solder to the surface of the steel, it is advisable to add acid. Suitable for stainless steel and steel, with tin/lead solder, min 60% Sn. Flux ZN11 Zinc chloride-based soldering fluid, corrosive residues. Removal of residues with hot water + citric acid. Use a brush or cloth to apply it to the parts to be assembled which must be heated with a soldering iron or a blow torch. Recommended for assembling zinc sheets, guttering and pipes. Also effective for soldering zinc-titanium, galvanised sheets and copper. with brush Zinc chloride-based soldering fluid, enables the formation of excellent soldered joints thanks to the chemical agents which guarantee very good wettability. Apply with a brush or cloth. Recommended for all metals except stainless steel and aluminium. 100 g pot Smooth, water-soluble, ecological cream, specially designed for the creation of real metallurgical joints on copper, brass and tin-based alloy installations. No prior cleaning is required. Suitable for copper and its alloys, brass, tin and its alloys. t is essential to use a brazing flux when assembling parts using a tin-based filler metal. It must be evenly applied to the parts being assembled via dipping in a bath, spraying or with a brush. The brazing procedure must begin as soon as the flux has been applied to prevent the flux from evaporating. Although the flux has a pickling function, it is highly recommended to clean and degrease the parts before application. What’s more, you should use a flux that is compatible with the melting temperature of the filler metal.